The Monarchy was a 2001-2002 Wildstorm comics series. 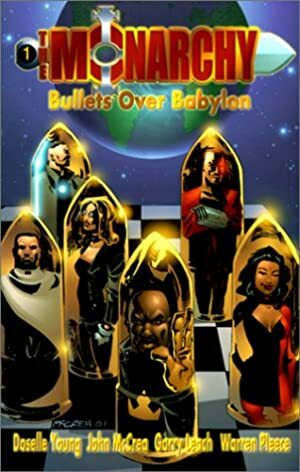 Written by Doselle Young, it felt very Grant-Morrisonian both in storytelling and in themes – the super-hero as an allegory for transformation, decaying reality and how to fix it, the super-hero as an altruistic protector and defender, weird-arse visuals and concepts, stuff that only makes sense some issues later, etc. Base Of Operations: The Crown, Kansas. 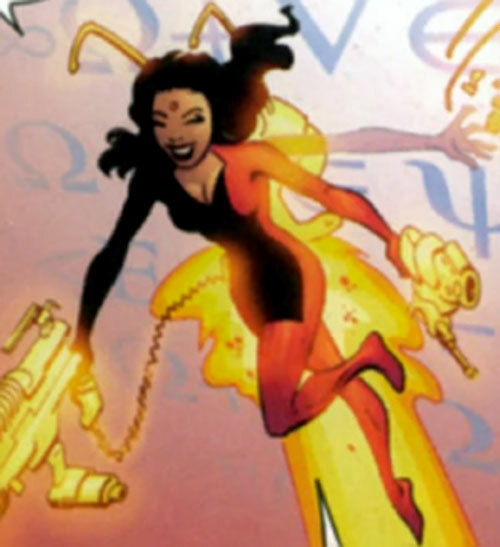 Due to her connection to a super-computing neutron star Professor Q has a vast superhuman intellect. She can master hideously complex technology and concepts. Professor Q is capable of designing and creating complex objects out of thin air, within seconds. She’ll usually create energy guns, projectile weapons, jet packs or stuff like miniature black holes. She has some level of control over her endocrine system, and can slow down her perception of time. Also, she seems capable of manifesting extra arms as well as multiple copies of herself and at varying sizes. Little is known of her life before joining The Monarchy, even by the Professor herself. She has only recently remembered her name. Professor Q was introduced to King by “Business Associates”, extra-dimensional arms dealers, from whom King may have bought her. She is responsible for a number of the high tech systems in the Crown, including its teleportation system, as well as the Crown itself. She also improved and strengthened the Monarchy’s version of the Carrier. The Professor takes joy in using her abilities and solving problems, although she has shown no real interest in regaining her memories. She can be both vivacious and highly analytical, curious and cold, cheerful and uncaring. Unlike most comic book scientists, she seems to appreciate the use of violence and destruction. The super-computing star that provides her powers is actually Solaris. He used Hourman’s powers to smuggle her back in time with the Justice Legion A, but something went wrong in transit that left her lost and amnesiac. Her link to Solaris has allowed his current version to be aware of her, but he hasn’t used her yet, preferring to let her infiltrate the superhero community first. Extra Limbs are not always active and may be summoned at will (+1). Shrinking may only be used by Split duplicates (-1). Split duplicates suffer no AP loss (+3). Superspeed may only be used to subtract from the time to perform a task (-5). 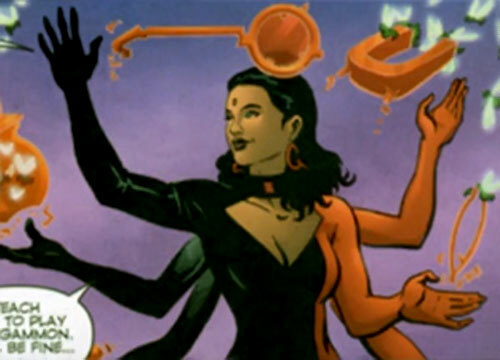 – Six-Armed Goddess — Extra Limbs 4, Projection, Sustained. – Levitation — Flight 1, Limited (speed 0), Subtle. – Given Time — Quickness 12. – Create Virtual Objects — Variable 6. – Duplication — Summon 14, Controlled, Heroic, Multiple Minions 2; Summons a duplicate identical to her but with Shrinking 16 and no Duplication. Defensive Roll 2, Ranged Attack 9. Athletics 3 (+4), Close Combat: Unarmed 2 (+5), Deception 4 (+6), Expertise 10 (+20), Insight 12 (+18), Perception 7 (+13), Persuasion 3 (+5), Technology 14 (+24). Thrill-Seeker Q craves excitement and danger. Amnesia Professor Q does not know her own origins, even barely remembering her own name. Trade-off areas. Attack/Effect PL 13, Dodge/Toughness PL 7, Parry/Toughness PL 6, Fort/Will PL 10. Points total 276. Abilities 56, Defences 18, Skills 28, Powers 162, Devices 0, Advantages 12. Equiv. PL 19. Her Create Virtual Objects power is most commonly used to create Ranged Damage effects or Create, but can also create jet packs (Flight) and other complex objects. She is limited to about 15 ranks in any one effect. Her nominal PL is 14. Source of Character: The Monarchy comic. Helper(s): Sébastien Andrivet, http://members.fortunecity.com/themonarchy/ (defunct), M&M stats by Pawsplay.